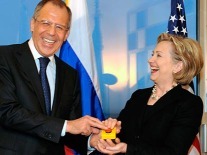 In 2009, U.S. Secretary of State Hillary Clinton presented the Russian Foreign Minister Sergei Lavrov with a joke gift: an industrial control button. The U.S. Department of State had been saying that they wanted to "reset" the US-Russian relationship. So the button was labeled with what the US Department of State believed were the English and Russian words for "reset". A lot of attention has been paid to the labeling mistake. The Russian word mistakenly used was peregruzka, which means "overload". The Russian word for "reset" is really perezagruzka. You see, the actual Russian word would be перезагрузка, because Russian is written with the Cyrillic alphabet. The U.S. Department of State even used the wrong alphabet! Cyrillic is currently used by the East Slavic languages of Russian, Belarussian, and Ukrainian; and by the South Slavic languages of Bulgarian, Serbian, and Macedonian. Plus some languages of peoples from the former Soviet Union (Kazakh, Uzbek, Turkmen, Kyrgyz, Tajik, etc). Quick, someone tell the State Department! Lavrov pointed out the error of the wrong word, but he said that he would keep the button on his desk anyway. Probably because he wants to start every day by laughing at the ignorant Americans. How could such a glaring error as the wrong alphabet go unnoticed? 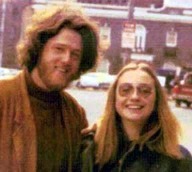 Hillary Clinton may be frighteningly hungry for power, but she's intelligent, and she and Bill have certainly been to Russia numerous times starting in the 1960s. The button: even more wrong than you thought. And think about how many people who saw and handled the item before it was given as a silly gift. It must have been carefully examined dozens of times. But remember that this is the government that feels it is necessary and useful to ask you multiple times in an airport if you happen to be carrying luggage on behalf of strangers. Lavrov: "I can't believe the Americans are this ignorant!" Shaggy and Velma in the 1960s. Anyway, Americans generally can't read or understand any Russian, but we have been well conditioned by advertising and movie posters to know that Russian is written with a distinctively different alphabet. See the below pages for how to use real Russian characters in your web pages and printed documents.